If you could save a life, would you? 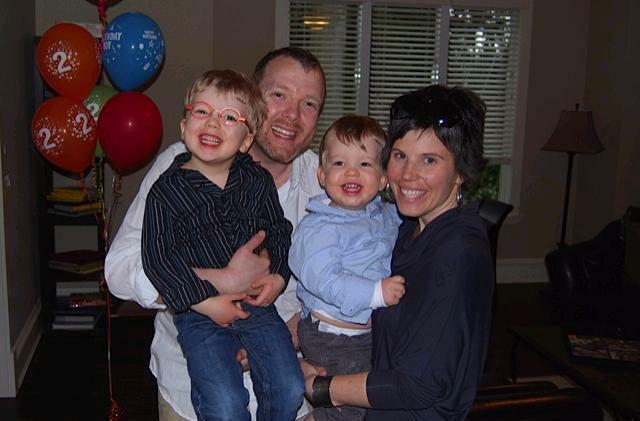 Erica (pic, at right) is a mom of two boys, ages five and two. She is fighting acute mylogenous leukemia (AML) and is in urgent need of a bone marrow transplant. No matching donor has been found, and Erica is running out of time. Her husband Harley was a law school classmate of mine. He is asking everyone to please consider joining their country’s donor registry – the person who can save Erica’s life could be anywhere. The majority of matches are between unrelated people. Fewer than 1 in 500 people who register are ever contacted to donate, but if you are a match, you can save a life – maybe even Erica’s. The process starts by filling out a simple online questionnaire. If you are eligible to donate, your registry will send you a kit to take a cheek swab and return it to them. In most cases, registering is free. Joining the registry does not obligate you to donate. If you are a match, there are two ways to donate. The most frequently used method is via peripheral blood stem cells. It is similar to donating blood, but you take a drug for a few days before the donation to pump up your blood-forming cells. The other method involves day surgery under a general anesthetic. A needle is inserted into the pelvic bone through a small incision and the marrow withdrawn. In both cases, people return to work within 1-7 days and feel completely recovered within 2-3 weeks. It takes the body only 4-6 weeks to replace the donated cells or marrow. The donor’s medical costs are usually completely covered. Here are links to the donor registries for the top four English-speaking countries that make up the traffic for this blog. If I haven’t included your country, a simple Google search will probably bring up your registry’s website. The Internet can do amazing things. A guy from Toronto recently took up an online collection for an elderly bus monitor in New York after viewing a Youtube video of her being bullied on the bus. He wanted to send her on a nice vacation. Within weeks, he raised over $600,000 for her. Imagine what could happen if everyone who read this post decided to register as a potential donor? Thanks for reading this. I’m hoping for some magic. Please feel free to share and distribute this post – Erica’s match is out there, somewhere. ago and a recent pic of Erica in hospital. 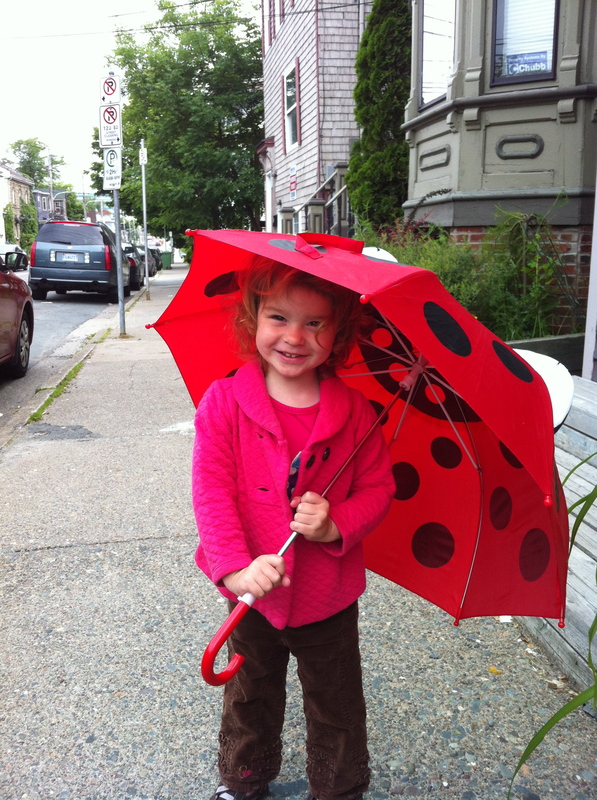 On the afternoon of June 6th, we were told that Erica had acute mylogenous leukemia (AML). and a first round of chemo was started on June 8th. The first round lasted 7 days. of chemo had done its job. Instead of a clear marrow, what showed was about 10% "immature"
chemo treatments, her bad cells were estimated at 26%. this result means that she is in the "high risk" designation for AML. transplant (BMT) are the urgent course of treatment. We need your urgent assistance with the bone marrow. somewhere in the world, that donor has to confirm their consent. the chemo does its job and the marrow is clear. registry very quickly, you may be able to assist Erica. registry to donate their stem cells/bone marrow if they are able. reference if you prefer a hard copy to read. swab done at their location. Time is of the essence. platelets really is until you are receiving them. Thank you for your thoughts, prayers, strength and support. Thank you for spreading the word and circulating our plea. Thank you for helping to bring Erica home. "fighter" cells working again in her body). Summer 2012 is here! It’s Canada Day weekend and the weather has come out smokin’ hot. 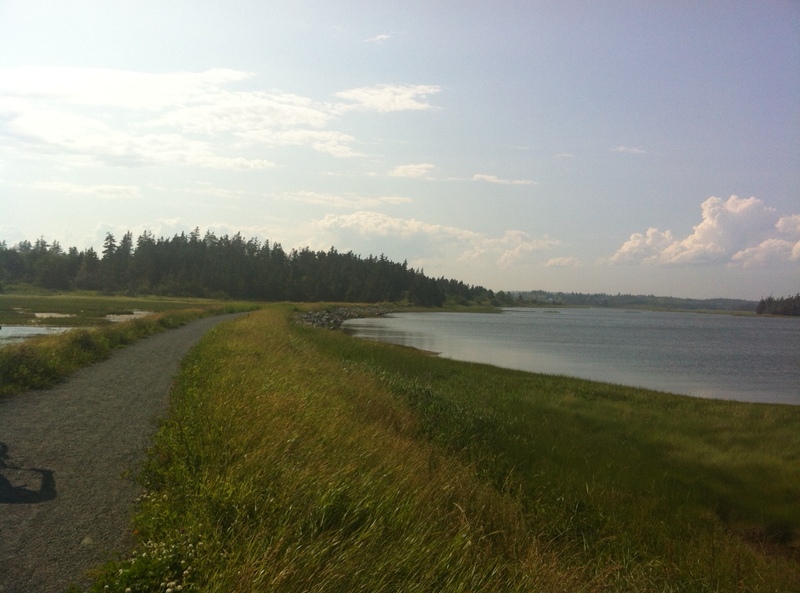 I was out for a two hour ride yesterday along the gorgeous Saltmarsh Trail in Dartmouth, Nova Scotia (pic below). There’s lots of news. The BIG news is that Spinning Music will soon be moving to a new home, which will allow for many site improvements, including forums to replace the Bike Cafe page and the now-clunky Reader Playlists page. It has so many posts that it is very slow to load and even crashes in some browsers. I am still working on acquiring the URL – will post as soon as I have it. In much smaller news, I recently acquired another weekly class (mostly men – interesting!) and I’ve been really enjoying the extra time on the bike. This is one of two playlists I’ve been enjoying of late. My regular riders tell me this is one tough ride. Call Me Maybe – Carly Rae Jepsen (3:13): Critics are calling this THE song of summer 2012. This young Canadian artist (and veteran of Canadian Idol) has taken the pop world by storm as her tune streaked to number one in Australia, Canada, Czech Republic, Denmark, Finland, France, Hungary, Ireland, New Zealand, Switzerland, the United Kingdom and the United States, and peaked in the top five in Austria, Belgium (Flanders), Germany, Netherlands, Norway and Poland. There’s even a Youtube video of Barack Obama singing it (with the lyrics cleverly spliced from his many public addresses). We’re going to use the song to warm up, so take that tension knob and push it up and away from you until you can feel the road under your feet. Turn Me On (feat. Nicki Minaj) – David Guetta (3:19): An out-of-the-saddle climb with a couple of tension increases. Jet Lag (feat. Natasha Bedingfield) – Simple Plan (3:24): These Canadian rockers out of Montreal have almost the same knack for catchy pop tunes as Jepsen does. Let’s do some sprints: 30/30/30 seconds at 0:40 – 1:09, 1:35 – 2:02 and 2:32 – 3:10. Adrenaline (Original Mix) – Liquid Soul (7:51): I’ve used this song before, but in this incarnation my riders tell me it’s the toughest part of the class. Good thing it comes early! This is a combo drill alternating between a minute of standing climb and a minute of surging (seated, 80% of your max, a not-quite-sprint). You”ll need medium tension here – about 5/10 or 50% of your max. Sounds easy? Look at the length of the song – there are four sets. That’s eight minutes of work before the next break. Never Close Our Eyes – Adam Lambert (4:08): Adam Lambert is back with that great big voice. Take a swig from your water bottle and give your shoulders a few rolls while the song gets going. Crank the tension up medium-high to about 7/10. When the bass kicks in (around 0:30) we’re going to start with 8 count jumps for the verses. When the bass stops as we head into the chorus, come up out of the saddle into a standing climb and when Lambert hits the chorus, we’ll sprint! 30/30/30 at 1:15 – 1:45, 2:30 – 3:00, 3:30 – 4:04 . After the first chorus, it’s back to 8 count jumps. After the second chorus, there’s a bridge from 3:00 – 3:30. Use that for a quick breather. The third sprint starts at 3:30 and takes us through the end of the song. Part of Me – Katy Perry (3:35): More sprints – 30/30/30 seconds at 0:30 – 0:60, 1:30 – 2:00 and 2:30 – 3:00. The breakup lyrics suggest this song might be about Russell Brand but Perry denies this – she says the song was written in early 2010 but wasn’t included on the Teenage Dream CD because it didn’t fit with the other songs. Marry the Night – Lady Gaga (4:25): Still more sprints – hmm, could this be why my riders found this class so tough? Three of them again, 30/30/30 seconds. They’re at 0:42 – 1:11, 1:50 – 2:20, and 3:00 – 3:28. Haven’t Had Enough – Marianas Trench (3:29): Shift gears here and we’ll do some jumps on a hill. Tension up to 9/10 and give me 8 counts for the verses and 4 counts for the choruses. These guys hail from Vancouver, British Columbia and they’re opening for Jepsen in Dartmouth, Nova Scotia on July 13. Tonight Tonight – Hot Chelle Rae (3:20): It’s back to jumps on a hill, but at a lower tension – 7/10 for this one. Mix it up between 8, 4, and 2 counts. Stronger (What Doesn’t Kill You) – Kelly Clarkson (3:42): One teensy weensy sprinting tune to finish us up with that pleasantly thrashed feeling. 30/30/50 seconds here, at 0:43 – 1:15, 1:40 – 2:14 and 2:39 – 3:29. I always coach riders to take sprints as they choose: standing, seated, or as surges, but I also encourage them to push just a little harder. Sometimes I ask for a show of hands, who has chosen to do the next sprint interval standing? (the better to get the competitive juices flowing). I remind them that they can start standing and sit down if they don’t have the juice to finish, but you know what? If I can get them out of the saddle, that’s where they stay. One Life – Hedley (3:33): Ahhh…. cool down with some inspiring lyrics. Like Carly Jepsen, the lead singer for this British Columbia band is an ex-Canadian Idol contestant. Young Homie – Chris Rene (3:29): Rene finished third on the first season of The X Factor (USA) and I was rooting for him all the way, as he left garbage collection and drug addiction to find his musical roots as a singer-songwriter. Some extra cool down and goodbye music. Happy (and safe) riding, everyone.